Our understanding of this little corner of Italy comes slowly and often in unexpected ways. Sometimes we’re baffled by behaviors we thought were based solely on cultural difference. Now we’ve come to realize that history is deep and memories are long here. This shared history continues to shape contemporary behavior, especially in a place where change is experienced slowly and often with great trepidation. The oldest section of Masseria Pilano located on the plains below Martina Franca. When we first landed in Puglia over 19 years ago, we were just passing through. Then we fell deeply and irretrievably in love and consummated our new relationship by putting down new roots. As we dipped our toes in this new, unfamiliar water, new friends were eager to share their advice, a rich stew of local lore that addressed almost every aspect of daily life. This well-work track was traversed by the brigands of old along with the shepherds who followed the transumanza, the seasonal movement of cattle and sheep from the mountains to the sea. and brigands (briganti) in southern Italy in the 1800s, the foundation of their concern was illuminated. Arte Franca Laboratori Urbani is a terrific organization founded by young Martinesi who want to connect locals and visitors to the rich and varied history and culture of Martina Franca and its backyard. 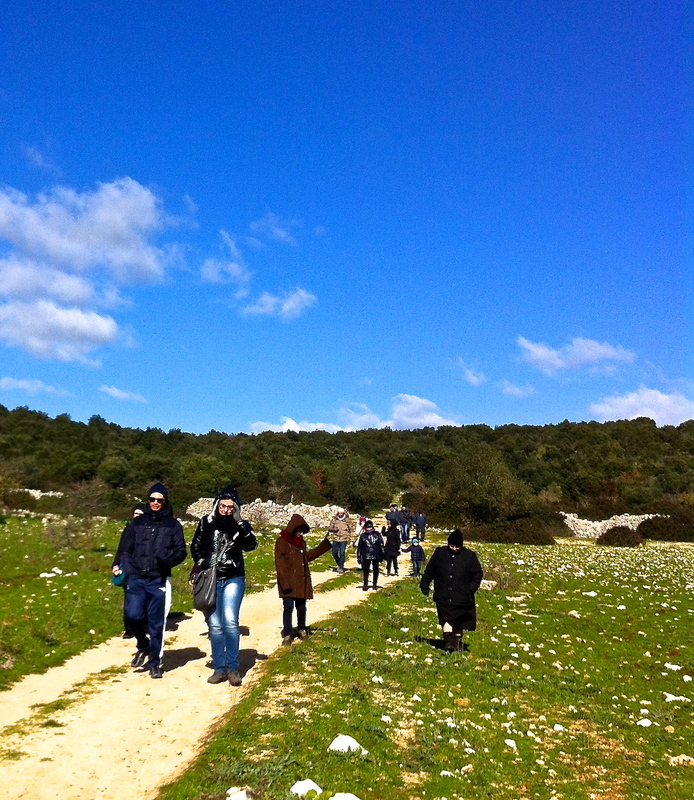 Last Sunday, we joined a group of young Martina Franca residents for a walk led by Antonio Serio in the scary countryside we’d been warned against. This group, called Arte Franca Laboratori Urbani, has formed an organization devoted to making local culture and history relevant to a younger generation through walking tours that visit unlikely places in search of the people’s history. Yesterday’s walk focused on the storied brigands, male and female, who roamed these hills in the mid-1800s, attempting to disrupt a feudal system that held the peasantry in absolute poverty but wreaking havoc among the citizenry all the while. 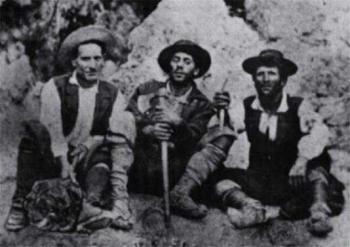 A rogue’s gallery of brigands, these three roamed the countryside south of Martina Franca (Photo credit: http://www.iltaccodibacco.it). .
benefit only the middle and merchant classes. These bands, led by often colorful, charismatic figures, sought shelter between friendly fortified farms (masserie) while attacking farmers, shepherds and travelers who weren’t among their confidants. These forays made the country roads especially unsafe at night; the masserie secured livestock and family members inside tall stone walls and hoped for the best. The brigand business provided equal opportunity for women in a time when opportunities were non-existent. Female brigands, called brigantesse, were colorful figures who contributed substantially to the brigand story in Italy (Photo credit: http://www.diavoleggo.com) . The newly formed Italian government treated the brigands harshly. These popular figures had the potential to tip the fledgling state into the abyss of anarchy, so brigands and those who provided them with aid and comfort were often condemned to death. Peasant farmers were compelled to hide poison in the food they gave the brigands, since often these unfortunates found themselves between a rock and hard, hard place and risked death at the hands of the brigands if they didn’t acquiesce to demands for food and shelter. The situation became almost ungovernable, forcing peasants to flee some areas for protection. Not surprisingly, almost 150 years later, these are the areas that we were warned against. I’m happy to report a total absence of swashbuckling brigands in our backyard, but these stories die a very slow death. More commonly, they typically persist without a contemporary understanding of the historical context that gave rise to them. 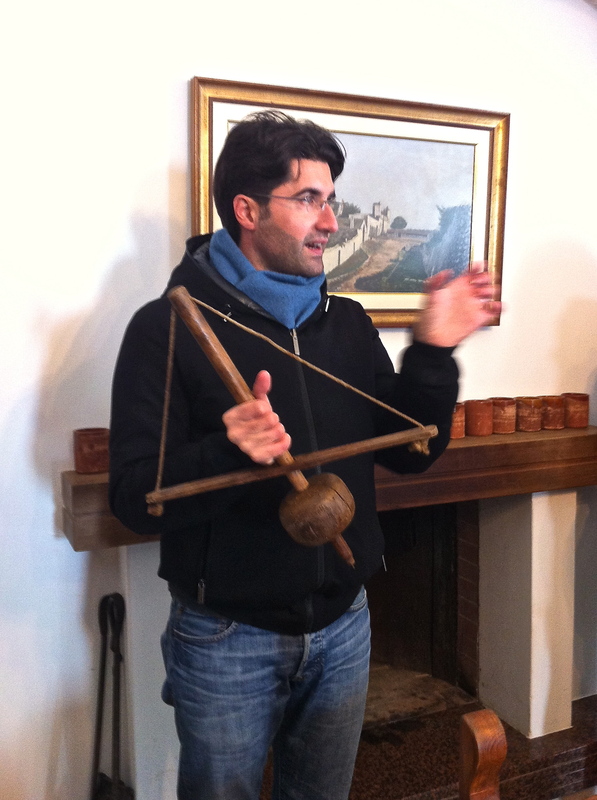 Pierpaolo Palmisano, demonstrates an antique drill press used to repair ceramic pottery at his family’s masseria. 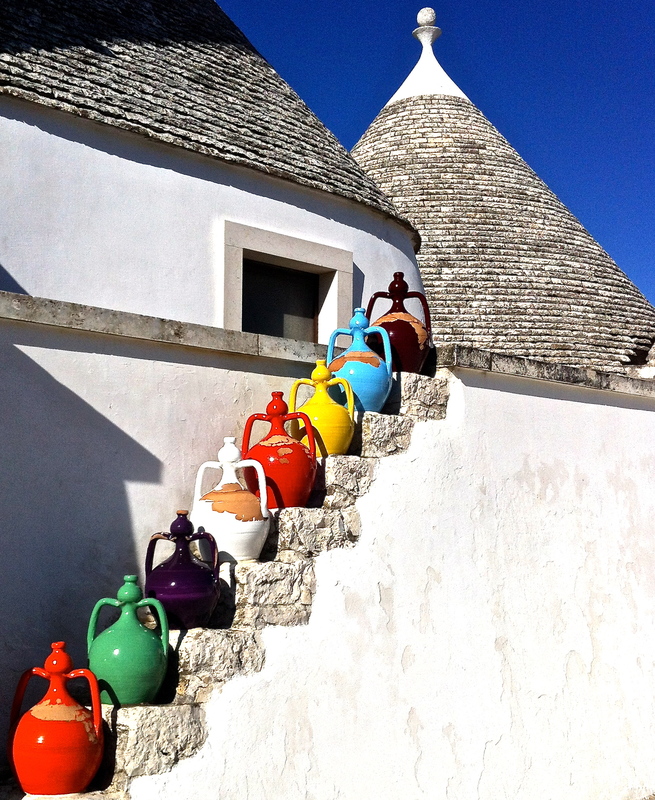 Colorful terracotta pots from nearby pottery capital Grottaglie line the steps to one of the terraces at Masseria Pilano. least, we understand the nature of contemporary local nervousness still connected to their heavy footprints. I love having my own personal tour of Italy delivered to my desk at home. Thank you for another great post. So happy to hear you’re enjoying nuovastoria. It is such a pleasure to know that you find these Italian cultural stories as engaging as I do when I discover them. Thanks for getting in touch–I love to hear from you. Really interesting about Arte Franca…thanks for sharing! Hi Peggy–Arte Franca IS interesting because it was formed by a group of passionate young Martinesi who want to make sure that their culture, stories and shared experience is valued and shared with locals and visitors alike. We hear a lot about the lack of opportunity in Italy, particularly in southern Italy, and the reality is doubtless pretty sobering. But then there are young people who are just coming in their own with innovative, creative ideas that they are launching, admittedly without an awful lot of help from the Italian state. I love their enthusiasm and energy and try to support them at every turn. So glad you liked hearing about this particular example of hope for the future. Cultural management—what a fantastic field. And so much to manage here in Italy . . . ! Please do stay in touch. I’d love to share anything more I uncover about unique approaches to sharing these treasures with a larger audience. Really interesting post. Can’t wait to explore Puglia in person. Hi Jan–Come visit! You will love it here. There are layers upon layers of history, a phenomenal food and wine culture and the gorgeous sea. What’s not to like? Let me know if you are planning a trip and I’ll share my favorite tips. 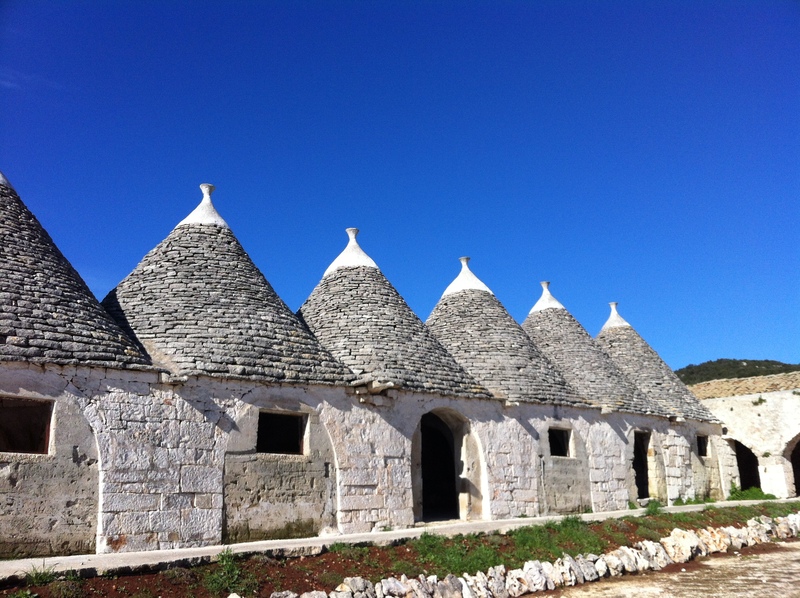 i am eager to explore Puglia, especially after your enlightening post. I’m tickled to read about the young people using their creativity to create jobs for themselves and a lifestyle.